Gigi Hadid celebrates sister Bella Hadid's birthday with sweet throwback photo | HELLO! Gigi Hadid was in a reflective mood as she celebrated her sister Bella Hadid's 20th birthday on Sunday. The model shared a childhood photo of herself and Bella playing together on a balcony, telling fans that she was so "proud" of all her sister had achieved. 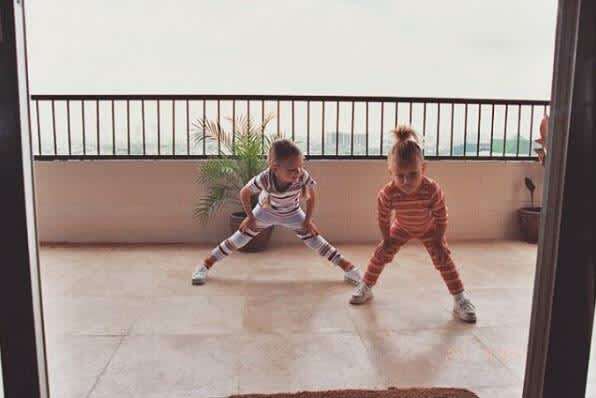 Alongside the photo of herself and Bella standing in co-ordinating stripy ensembles and white trainers, Gigi wrote: "Happy birthday to my baby sister @bellahadid. Your beauty and beautiful heart blow me away more every day. You make me more proud than you'll ever know, and I feel so grateful that we get to experience so much by each other's side. "Can't believe you're 20!!!!!!!! Love ya miss ya kiss ya." Unsurprisingly the snap was a hit with Gigi's fans, with many commenting on how "cute" the models were as children. Bella also shared a childhood photo to mark the occasion, posting an Instagram snap of herself as a baby with her mum Yolanda Foster. "20 years ago with the woman who birthed me," she wrote. "I love you #20." The model celebrated her special day in style, heading out for a night out in New York with a group of friends, boyfriend The Weeknd, and her mum Yolanda. Bella ensured she turned heads in a daring chainmail crop top and wrap skirt, which she layered with a faux fur jacket and metallic accessories. Yolanda posted photos from Bella's birthday night out on Instagram, including a photo of the birthday girl planting a kiss on her cheek as they both clutched a bunch of gold balloons. "And many more to come my love… @bellahadid #CelebrationofLife," Yolanda wrote.